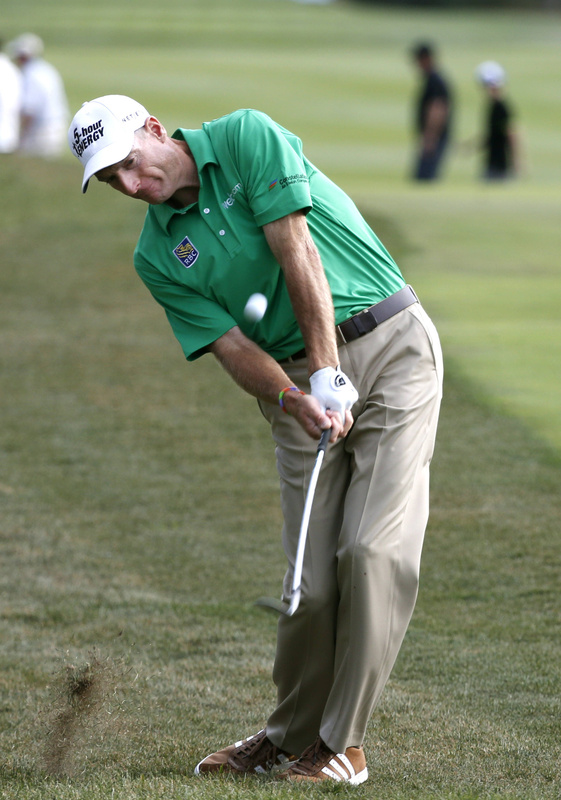 Golf: Jim Furyk recovered from a sluggish start with three birdies in a five-hole stretch Saturday in the third round of the BMW Championship in Lake Forest, Ill.
Matt Kuchar had a 61 in the morning when conditions were calm – with firm fairways, fast greens and increasing wind. Furyk was at 13-under 200 and will be paired in the final group with Stricker, who holed out for eagle from the 15th fairway and had a 64. Brandt Snedeker, tied with Furyk to start the third round, got up-and-down from behind the 18th green for birdie to get back to even-par 71 for the day and remain in the hunt just two shots behind. Tiger Woods is in the picture at four shots back. • Miyazato holds slim lead at Evian: With teen amateur Lydia Ko of New Zealand in pursuit, Mika Miyazato of Japan held a one-stroke lead after two rounds at the Evian Championship in Evian-les-Bains, France. Miyazato shot a 2-under 69 and was at 8 under with a round to go in the fifth and last women’s major of the year. The four-round tournament was cut to 54 holes after rain left the greens soggy. Ko, 16, had four birdies in an error-free 67. • Noh takes three-stroke lead: South Korea’s Seung-Yul Noh shot a 1-under 70 to take a three-stroke lead in the Nationwide Children’s Hospital Championship in Columbus, Ohio, the third of four events in the Web.com Tour Finals series. Noh had a 10-under 203 total on Ohio State’s Scarlet Course. Spokane’s Alex Prugh is at 1-over 214 after shooting a 1-over 72 during the third round. Cycling: American veteran Christopher Horner protected his overall lead in the decisive next-to-last stage of the Spanish Vuelta. The 41-year-old RadioShack-Leopard rider was 3 seconds ahead of Italy’s Vincenzo Nibali going into the 20th stage, a grueling mountainous ride through Alto de L’Angliru, Spain. The 88-mile stage was won by Kenny Elissonde in just less than 4 hours. The race ends with today’s traditional arrival in Madrid. Tennis: Canada is now in a remarkable spot – one victory from the Davis Cup final. The Canadians beat Serbia in a five-set doubles match for a 2-1 lead. Daniel Nestor and Vasek Pospisil outlasted Nenad Zimonjic and Ilija Bozoljac 6-7 (6), 6-4, 3-6, 7-6 (5), 10-8 in 4 1/2 hours on the red clay at Belgrade (Serbia) Arena. The winner of the best-of-five semifinal will play for the title in November against the Czech Republic. • Czechs oust Argentina: Defending champion Czech Republic reached the Davis Cup final after winning its doubles match in Prague to eliminate Argentina. Tomas Berdych and Radek Stepanek defeated Carlos Berlocq and Horacio Zeballos 6-3, 6-4, 6-2 to give the Czechs an unbeatable 3-0 lead in the best-of-five semifinal. Sailing: Emirates Team New Zealand nearly capsized in Race 8 of the America’s Cup, allowing defending champion Oracle Team USA to sail away to a 52-second victory on windy San Francisco Bay. It was the second victory of the series for the American syndicate, which has erased the two-point penalty it was assessed in the biggest cheating scandal in the 162-year-history of the America’s Cup. Team New Zealand leads 6-0. The most heart-stopping moment in the regatta came as the Kiwis tried to tack on Oracle on the upwind third leg. The 131-foot wing sail didn’t pop the right way and the 72-foot catamaran began to tip over, with its starboard hull hanging in the air for several seconds before splashing down. Basketball: Slovenia powered into the quarterfinals of the European basketball championship with a 73-65 victory over Greece in Ljubljana, Slovenia, with point guard Goran Dragic scoring 28 points. Slovenia joined Croatia in the last eight and its victory allowed Italy to advance as well, despite its 76-68 loss to Croatia. Spain, the defending two-time champion, cruised past Finland 82-56. Spain, with two wins and two losses, plays Italy (2-2) in its final second-round game. Greece and Finland also still have a chance of making it to the last eight. Greece (1-3) plays Croatia (3-1), and Finland (1-3) goes against Slovenia (3-1). From the other group, France, Lithuania and Serbia have already advanced.